This Electronic Project of Single Ltc Power Supply circuit is very low cost, and high efficiency battery-powered applications. 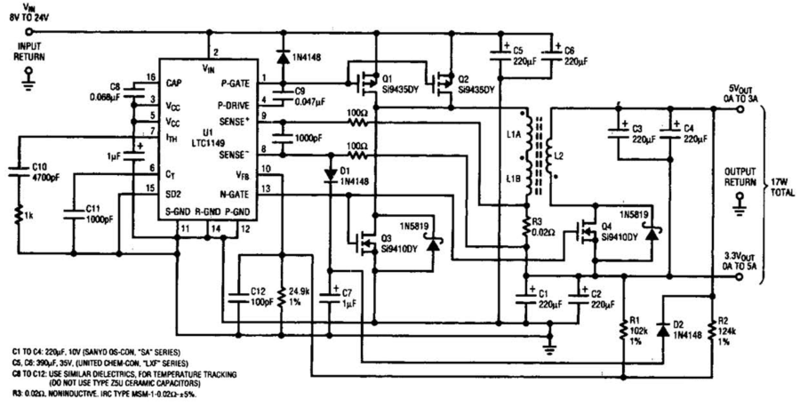 One LTC 1149 synchronous switching regulator can deliver both 3.3- arid 5-V outputs. The design`s simplicity, low cost, and high efficiency make it a strong contender for portable, battery-powered applications. The circuit described accepts input voltages from 8 to 24 V, to power any combination of 3.3-V and 5-V loads totalling 17 W or less. For input voltages in the 8-V to 16-V range, the LTC1148 may be used, reducing both quiescent current and cost.